If you love tropical fruit, chances are you love pineapple, too. But pineapples are one of those fruits that are really difficult to figure out how to pick. Luckily there are some really simple ways to figure out whether or not a pineapple is ready to eat or not. 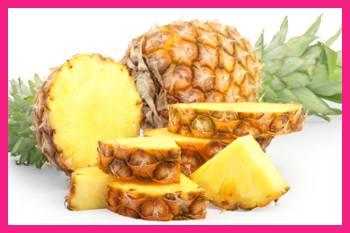 You want a ripe pineapple, because if you get an under-ripe pineapple it can be very acidic and hard on your stomach. Also, a pineapple that isn’t ripe enough isn’t very juicy and is not very tasty. Here’s how to ensure you are picking out a delicious, juicy, ripe pineapple. Some markets are not very happy with visitors who pull leaves out of the produce, but most of them don’t notice or don’t mind if you take a small tug on a pineapple leaf. If you pull on the leaf by giving it a few gentle tugs and it doesn’t come out, it’s probably not ripe. On the other hand, if you barely pull on the leaf and it slips right out, it might be rotting already. Give a gentle tug, like you were straightening your shirt, and if the pineapple leaf comes out with minimal resistance you’re good to go. The beautiful pattern that makes up the exterior of a pineapple also serves as a poking platform for shoppers hoping to find a ripe pineapple. If you push slightly on one of the little hexagons covering the exterior and it gives ever so slightly, you likely have a ripe pineapple. If the skin doesn’t give at all, the pineapple is not ripe, and if it sinks in, it’s rotten. The easiest way to tell if a pineapple is ripe or not is to lift it up and smell the bottom. The base of a pineapple should smell strongly of sweet, delicious pineapple. If you can’t smell anything, the pineapple is not ripe. Color is not the best indicator of ripeness, as some ripe pineapples are yellow and some are very green in appearance. However, a general rule of thumb is that the higher on the pineapple the yellow color goes, the riper it is. Almost every pineapple that is ripe enough to eat has a yellow base; however, if the pineapple has the right smell and you can pull out a leaf easily, don’t put too much weight on the color. Color is a helpful indicator at times, but certainly not the definitive characteristic of a ripe pineapple. There are a few things you need to keep in mind as you shop for a pineapple. By looking for the above indicators of ripeness and keeping the following things in mind, you can almost guarantee that you will pick out a perfect pineapple. • Pineapples do not ripen after they are taken from the tree, so if a pineapple is not ripe at the store, it won’t get any riper at home. • To make sure you’re getting a wonderful, juicy pineapple, feel for weight. If a pineapple with good indicators of ripeness feels heavy for its size, it’s bound to be a very good choice. • The easiest way to cut a pineapple is to cut off the top, slice it in half vertically, and then cutting the halves into slices, horizontally, from top to bottom. • Don’t throw the waste from your pineapple into the trash. Instead, put it in the green garbage can that most cities provide; that way it can become compost and be reused, putting the entire plant to use! 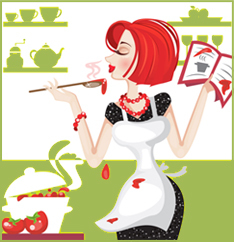 I’m always on the lookout for gluten free recipes as my daughter has to be gluten free. I found this book at Amazon (you can get it at almost all bookstores) that has a recipe for a gluten free Pineapple Smoothie that even I like.. (I LIKE GLUTEN, LOL). This is an affiliate link and we get a small commission if you decide to buy the book from the link below. We don’t hide that fact. It is not going to cost you anymore money, but it does help us pay our hosting fees.